I want to give this book to my friends, whether they are artists or not. Cat writes in an honest and non-judemental tone where the reader is easy with her voice and open to her ideas to help us make Art a Practice. I wrote about Cat here, where I explained that she asked to use some of my images for her new book. Findhorn Press did a fine job with the layout and design and they used 3 of my artworks in the book. Cat's new book arrived in my mail today. I've read through to page 60 of the 125 page book. As I read the first chapters, I heard myself saying, "yes, exactly!". Cat writes about how to get ourselves into a place of "Flow" in our creative practice. She gives 30 action practices, some based in yoga, to help us connect to our inner-artist self. 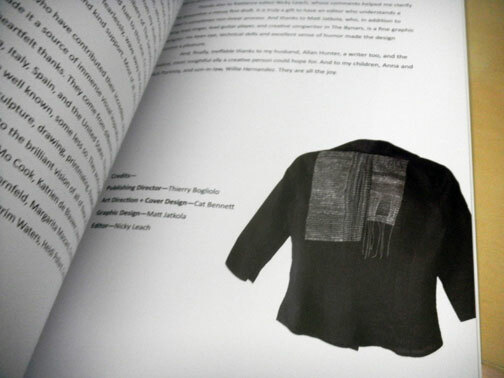 Page 90, One of my installation works. Page 125, one of my pieces. Stop in over there to look at her work and perhaps link over to Findhorn Press to order a copy today. TOMORROW EVENING .... I will announce the winner of the linen scarf!